Vittorio Introini (b. 1935) Striking geometric "Chelsea" dining table by Vittorio Introini for Saporiti, with a round top resting on a pyramidal base with an elegantly beveled head and foot, in walnut with stainless steel detailing. Italy, 1960's. 48" Ø x 29" H Literature: "Casa Amica, L’Angolo del Pranzo," 1969, p. 49. United States, 1960s Pair of Janus midcentury nightstands by John Stuart for Mt. Airy, in mahogany with brass pulls. Measures: 22" W x 27" D x 22" H.
A lyrical example of Vittorio Introinis' production for Saporiti, Italia. 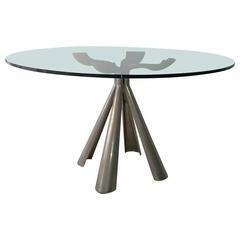 Round table made of lacquered wood and with tabletop cover of glass. Produced in Italy, circa 1950s. In great vintage condition. Dining table designed by Vittorio Dassi, Italy, 1950s. The table has a copper colored glass top and brass fittings on a wooden body. Feel free to contact us for more detailed pictures. Industrial 52" Round Steel, Metal & Cast Iron Dining Table. Height can be adjusted. Two of the four cast iron castors swivel. Prouve style base.